Annie Clark was born in 1844, fifth of the twelve children of James and Eleanor Clark of Street, Somerset. Annie's father was one of the founders of the firm C & J Clark and it was his idea to make slippers out of the offcuts left from the sheepskin rugs which were the original goods made by the firm. These proved so popular that the business switched to producing them and later other types of shoe. The Clark family dressed in 'free-labour' cotton in 1858. 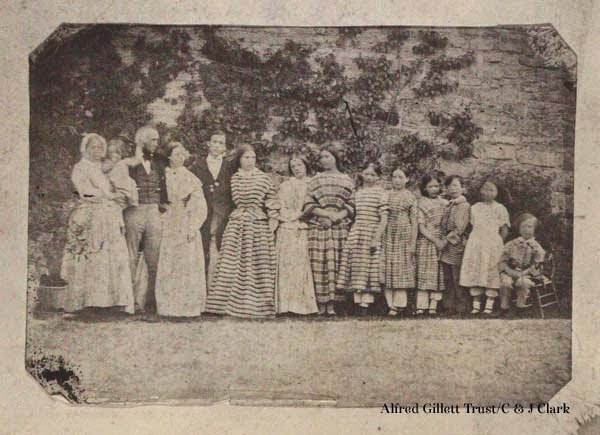 James and Eleanor (1st and 3rd from left), Annie (8th from left). Annie was educated privately at a girl's school in Bath and then lived at home, taking her full share in the work and duties necessary to her large family circle. Her mother was active in good causes, supporting the Abolition movement by selling and dressing her family in 'free-labour' cotton, produced by freed slaves. Annie did social service among the girls employed in the family factory, worked for the Bible Society and espoused the cause of temperance. From the mid 1860s she was an ardent supporter of Womens Suffrage, although in common with most Quaker women of her time she was a suffragist rather than a suffragette, seeking to advance the cause through argument rather than through confrontation. It was not until Annie was in her late twenties that she began to study for a university entrance examination with a view to taking up a medical career. At that time no hospital or medical school in England would admit women as students. There was however an open door in Scotland at Edinburgh and Annie Clark was one of the small band of women students who entered. Their only possible route to qualification was by way of the licentiate examination of the Society of Apothecaries. Suddenly, in 1874, the hospital authorities changed their policy, deciding that women should no longer be permitted to share in the teaching, and at the end of that year they were obliged to leave. 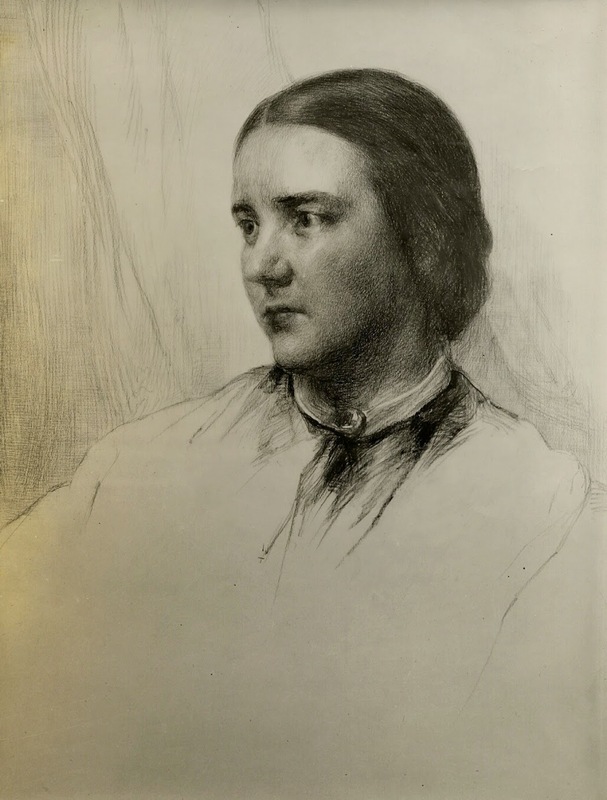 Sophia Jex-Blake, who had been a pioneer at Edinburgh in 1869, organised the Women's School of Medicine in London and Annie Clark went there. It was, however, still impossible for a woman to obtain a medical degree from any British university, so Annie was compelled to turn to Europe and to pursue her studies in a foreign language. She selected the University of Berne, which was German speaking, and after a two-year course she took her MD in 1877. It was still impossible for her to practice in the British Isles but just then Dublin adopted a more liberal view and she and twelve other women took the membership examination of the Royal College of Physicians of Ireland. Annie then spent some time in postgraduate work in Paris, Vienna and America before returning to England in 1878 to take up an appointment as house surgeon at the Birmingham and Midland Hospital for Women which had just moved to extended premises in Yardley. She remained associated with this hospital and with the Children's Hospital for the rest of her working life. She also built up a large private practice, gaining to a special degree the friendship and regard of a wide circle of patients, to whom she was affectionately known as 'Dr Annie'. The causes she had worked for when she was young remained important to her throughout her life. Annie Clark was convinced that the scientific truth about alcohol showed that its use as a drug was harmful. She recognised it as a depressant which lessened the chance of recovery in dangerous illness and so, in defiance of much criticism, she refused to order alcoholic treatment, a pioneering stance at the time. 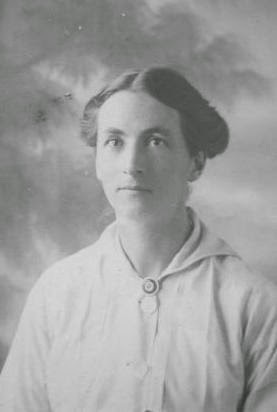 She also continued to support the suffragist movement in different ways and encouraged younger women, including Hilda Clark, her niece, and Maida Sturge, her cousin, to follow her into the medical profession. Quakerism was always an important part of Annie's life. She was described as 'an earnest Friend, laying stress on the value of regular attendance at meetings for worship and discipline. Except in cases of urgent necessity she never saw her patients until the hour of worship was over'. Annie Clark was nearly seventy years old when she retired in 1913. For many years travelling was one of her greatest pleasures and she made frequent journeys to Switzerland and the Tyrol. In 1920 her cousin Maida Sturge had set up a Birmingham Children's Home in the healthy air of the Tyrol and it is possible that Annie Clark took as much of an interest in that as she did in the rarer alpine flowers that were always an absorbing delight to her. She died in 1924 in her eightieth year. Thank you for that wonderful piece about Ann E. Clark! I stumbled upon it whilst researching into the life and work of her niece, Hilda Clark. A major part of Hilda's papers are held at Friends House Library. Do you know of any archive holding papers relating to Anne?